First. There is NO butter in an Angel Food Cake so it is NOT a butter cake, thus NOT Snow-drift, Silver, Lady or Cornstarch cakes. And. The recipe for Angel's Food (in fact 6 strikingly similar recipes) appeared years before the Angel Cake in the Boston Cooking School Cookbook by Mrs. Lincoln. Compare two of the recipes below. Angel Food Cake is a WHITE SPONGE cake (using no egg yolks) not a butter cake. The important feature - the one that gives it a light texture - is the lack of butter and using whipped egg whites, not because it is white. Many foods are white. Potatoes and Rice are white. The first cookbook recipe for 'White Sponge Cake' is in The Kentucky Housewife, 1839 (below), which predates the four butter cakes mentioned anyway. It came from sponge cakes (yellow with yolks), then on to the white sponge cake (no yolks). Second. The first recipe for Angel Food Cake is in the 2d edition (not in the 1st ed) of Isabella Stewart's The Home Messenger Book of Tested Recipes, Detroit, 1878. What's more, Angel Food recipes appear at least six times before 1884 (starting in 1878) and it was first called 'Angel's Food' - the current name - in the Home Messenger book. So, the 'Angel Cake' (not Angel's Food Cake) in Mrs. Lincoln's Boston Cooking School Cook Book is not the first recipe for Angel's Food. Whites of eleven eggs, one and one-half tumblers granulated sugar, one tumbler sifted flour, one teaspoonful of extract of vanilla, one teaspoonful cream tartar. Sift the flour four times, then add cream tartar and sift again, but have only one tumbler after sifting. Sift the sugar and measure; beat the eggs to a stiff froth, add sugar lightly, then the flour very gently, then vanilla. Do not stop beating till you put all in the pan. Bake forty minutes in moderate oven, try with straw; if too soft let it remain a few minutes longer. Turn pan upside down to cool, and when cold take out by loosening around the sides with a knife. Use a pan that has never been greased. The tumbler for measuring must hold two and three-quarters gills. Beat eggs on a large platter, and mix the batter on same platter. One cup of flour, measured after one sifting, and then mixed with one teaspoonful of cream of tartar and sifted four times. Beat the whites of eleven eggs, with a wire beater or perforated spoon, until stiff and flaky. Add one cup and a half of fine granulated sugar, and beat again; add one teaspoon of vanilla or almond, then mix in flour quickly and lightly. Line the bottom and funnel of a cake pan with paper not greased, pour in the mixture, and bake about forty minutes. When done, loosen the cake around the edge, and turn out at once. Some persons have been more successful with this cake by mixing the sugar with the flour and cream of tartar, and adding all at once to the beaten egg. Beat the whites of twenty eggs to a stiff froth, and stir very hard into it a pound of powdered loaf sugar, the juice and grated rind of a lemon, and the juice of two fine oranges. Beat them together till smoothly mixed, and then stir in very lightly and gradually three quarters of a pound of the finest flour. Do not beat it hard after the flour is stirred in, as it will make it tough and ruin the cake. Put it into a large square pan, that is well buttered, and put it immediately into a brisk oven, lessening the heat after the cake is well risen, that it may have time to soak thoroughly. Ice it very white and smooth; and if it is for a fine supper, place round the edge some very small gilded leaves, which is a common decorament on such occasions with some of the most fashionable people in America. This research was for my Sponge Cakes entry in the new Oxford Encyclopedia of Sweets and Sugar. HERE. 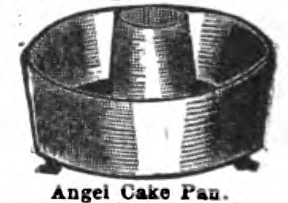 In a future post I'll cover other interesting info on the early history of Angel Food Cake... including the man who actually invented the cake (and perhaps write about the maze of primary sources to track him down).